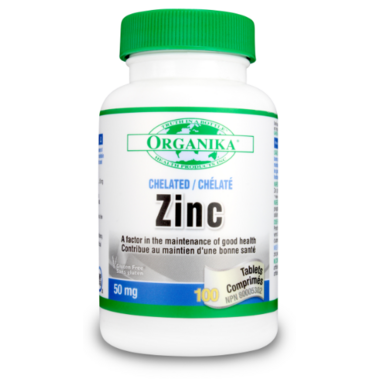 Organika Chelated Zinc is a factor for the maintenance of health. It helps to improve metabolism of carbs, proteins, and fats. For men, Zinc helps to increase free testosterone levels for better muscle growth and energy levels. It also helps in connective tissue formation for better skin and muscle health. Directions: Take 1 tablet once per day with food and a glass of water. Take a few hours before or after taking other medications. Non-Medicinal Ingredients: Calcium Phosphate Dibasic Dihydrate, Croscarmellose Sodium, Magnesium Stearate, Stearic Acid, Microcrystalline Cellulose. Caution: For adults only. Zinc supplementation can cause a copper deficiency.